HomeNewsTeam Calendar Posted… Now What? 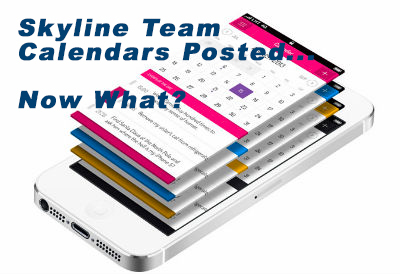 Team Calendar Posted… Now What? If you have repeating major conflicts with your team’s practices, please notify your coach of the repeating conflicts. Please do not notify Skyline admin of practice conflicts as there may be many conflicting request for your team. We have been through many versions of the practice calendar at this point and we do not have much room for adjustments. Please understand at this point we say NO to more requests than we say YES to, but we will endeavor. Every request we accommodate will impact at lease one other team if not more. In mid-December we will post the practice schedule for the January-April.